El Ejército alemán reclamó que los carros de la serie E tuvieran la transmisión posicionada en la retaguardia. Sin embargo, los E 50 y E 75 usaban el compartimento de motor-transmisión del Tiger II, que hacía imposible colocar la transmisión en la parte trasera. El E 50 Ausf. M fue un rediseño del proyecto E 50 con la colocación de la transmisión en la parte trasera. A tier X medium that actually has armor other tier Xs should pay attention to, the E50 M is a spearhead and sniper tank that is comfortable both staying back and picking off hitpoints at will or getting into the face of (or simply around) isolated or stupid opponents. A consummate master of flexibility in battlefield roles, the E50 M allows the expert player to flow smoothly from one task to another and thus allow other tanks to do their supposed jobs properly in order to attain victory. Extraordinary gun. Extreme accuracy, with good dispersion, high penetration, and fast aim time. Effective armor hardpoint for a medium, and no susceptibility to frontal engine module damage. Lower frontal hull and turret face are lacking in protection; however, the turret face comprises of a huge mantlet. Essentially flat gun depression directly from the front; however, it gets better to the sides. The E50 M is a definitive German tank. Powerful, high penetration, and extremely accurate, but a teensy bit cumbersome compared to its peers. The E50 M, like all other tier 10 mediums, fires APCR as its default ammo. Aside from price, it keeps all the characteristics of APCR, this is both a good and bad thing. APCR achieves its higher penetration potential in reality because it concentrates all the kinetic energy on a smaller point, and because it leaves the barrel at a much higher velocity. In game it's the same, and perfect for the 50 M's playstyle. 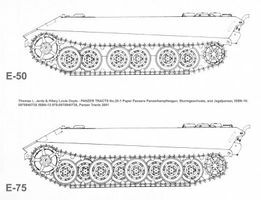 The combination of a fast traveling shell and extremely accurate gun makes hitting moving tanks at extreme ranges practically a walk in the park. The penetration loss inherent to APCR at range is not significant enough to worry about, as most shots will still get through weak spots in armor with careful aiming and a shred of luck. When supporting and sniping from the far rear is not an option, the 50 M is still quite home at close quarters engagements. The "good" all around armor will almost never be overmatched, except by the largest of gun calibers, and can therefore be used to bait tanks into being shot at at extreme angles. Even smart players might think they can get through, but if done correctly their shells will simply bounce due to sheer angles or autobounce entirely, leaving them open to a quick and accurate counterattack. However, despite the good armor, the 50 M is still not completely comfortable at close range. Its large size, somewhat bulky movement, and awkward depression worsened by height make it difficult to brawl in some, or most scenarios. You can get close, but only about arm's length at best, point blank brawl matches are best to be avoided, tempting though they may be with such a powerful engine. Another thing the 50 M excels at like almost no other is ramming. The thick front armor, heavy 62 ton weight, and high 60km/h top speed all come together to form a living battering ram, easily capable of removing massive chunks of health from all but the most heavily armored tanks like the Maus and E 100. Combined with a quick shot from the gun, the 50 M could very well deal ~1000 damage in the span of less than a second. However on the down side, the E50 M's armor profile isn't perfect. The turret and lower front plate are the prominent weak spots. The front of the turret has a high armor value, but barely any slope, meaning most guns it comes across can penetrate it; however, it was recently buffed in Update 3.1. And as per the norm of German tanks, the lower front is exposed and relatively weak. It can be expected that almost every time, shots will penetrate the lower front unless the enemy is a light tank or firing high explosive ammo. In addition, although the 50 M has very good accuracy and penetration, the damage per minute is sadly the worst in its class. Every other tier 10 medium has better DPM which they can use to pump out damage even faster. However, at range where said tanks might miss a lot, the E 50 M still has the upper hand. One more thing to note is that while the 50 M sports mediocre or bad gun depression on the front (-6 degrees) it gets much better towards the side, where it can depress its gun 8 degrees. This takes some getting used to as you need to angle your armor to maximize your gun depression, but it's a very valuable skill to learn as you will learn to both minimize exposure and get the most out of your tank. In all the E50 M is a very well rounded tank, possibly the most well-rounded tank in the game currently. It has the high speed of a medium, the laser cannon of a TD, and a chassis of a heavium. Esta página fue modificada por última vez el 25 oct 2016, a las 11:06.